A combination of wisdom teachings and memoir, Navigating the River of Time, shares incidents from the life of a confused but gifted young man who journeys halfway around the world and back in search of enlightenment, only to find his spiritual teacher in his own hometown. It’s a tapestry that brings together years of meditation practice with day-to-day practical living. As a young man, the author encountered scores of spiritual teachers who spoke about love, peace, and pathways to enlightenment. They told him to chant, to study the Bible or the Bhagavad Gita or other sacred texts, to live on esoteric diets, light incense and pray, but had no answers when asked, “How does one quiet the mind? How does one overcome the anxiety, depression, emotional quicksand, and internal chaos that keeps one from being happy? How does one live in a place like New York City and have a spiritual life?” There had to be a practical way of integrating wisdom with everyday living, and the author describes how he searched for and found it. Mr. Perrin shares personal moments from his life and integrates them with concrete methods of spiritual development. He shows the reader that the path to enlightenment can begin in the tenement districts of the South Bronx. He firmly believes that if he could do it, anyone on earth can. We’re all born with the tools: mind, breath, chakras, need, will, and gratitude. We just have to learn how to use them. The esoteric needs to be made practical, and Navigating the River of Time is a guidebook that can open doors to inner peace and happiness. I just finished reading this book – or I should say that I travelled on a journey. This was a trek of a human being who, through incredible and persistent effort, transformed his depressed, neurotic and anxiety-filled life into an amazing spiritual one. Stuart went from a confused seeker of truth to a true master of kundalini yoga – with a peace and quiet of mind, filled with joy, happiness, an open heart, and unconditional love to share! He really pours his heart out in this work and gives you a taste of what it takes to have a spiritual life. It’s open to anyone who really has the need. A powerful book that emanates Eternal Energy! I don’t care what your faith is or lack of faith, or whatever, but, if you have any desire to do spiritual work in your life, please, buy this book, read this book, feel this book, be grateful for this book! Navigating the River of Time is one of the best books on how to live a spiritual life that I have come across. It contains teachings that have effectively rocketed my life into pure joy and happiness; it contains actionable steps on how to live an enlightened life. 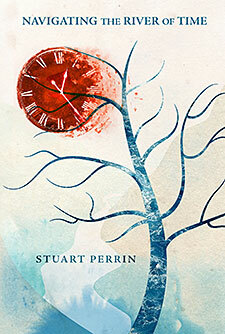 Dr. Don Baham interviews repeat guest, Stuart Perrin, about his latest book about meditation. Stuart is an astute student and teacher of the discipline to groups in many places around the world. Dr. Don’s daughter, Valerie, was an ardent listener and questioner during the interview.